Rice, the lifeblood of so many nations’ cuisines, is perhaps the most ubiquitous food in the world. In Asia, where an estimated 90 percent of all rice is consumed, the pillowy grains are part of almost every meal. In the Caribbean, where the starch is often mixed with beans, it’s a staple too. Even here in the United States, where people eat a comparatively modest amount of rice, plenty is still consumed. Rice is popular because it’s malleable—it pairs well with a lot of different kinds of food—and it’s relatively cheap. But like other starch-heavy foods, it has one central flaw: it isn’t that good for you. White rice consumption, in particular, has been linked to a higher risk of diabetes. A cup of the cooked grain carries with it roughly 200 calories, most of which comes in the form of starch, which turns into sugar, and often thereafter body fat. But what if there were a simple way to tweak rice ever so slightly to make it much healthier? An undergraduate student at the College of Chemical Sciences in Sri Lanka and his mentor have been tinkering with a new way to cook rice that can reduce its calories by as much as 50 percent and even offer a few other added health benefits. The ingenious method, which at its core is just a simple manipulation of chemistry, involves only a couple easy steps in practice. To understand what’s going on, you need to understand a bit of food chemistry. Not all starches, as it happens, are created equal. Some, known as digestible starches, take only a little time to digest, are quickly turned into glucose, and then later glycogen. Excess glycogen ends up adding to the size of our guts if we don’t expend enough energy to burn it off. Other starches, meanwhile, called resistant starches, take a long time for the body to process, aren’t converted into glucose or glycogen because we lack the ability to digest them, and add up to fewer calories. A growing body of research, however, has shown that it might be possible to change the types of starches found in foods by modifying how they are prepared. At the very least, we know that there are observable changes when certain foods are cooked different ways. Potatoes, for instance, go from having the right kind of starch to the less healthful kind when they are cooked or mashed (sigh, I know). The process of heating and cooling certain vegetables, like peas and sweet potatoes, can also alter the amount of resistant (see: good) starches, according to a 2009 study. And rice, depending on the method of preparation, undergoes observable chemical changes. 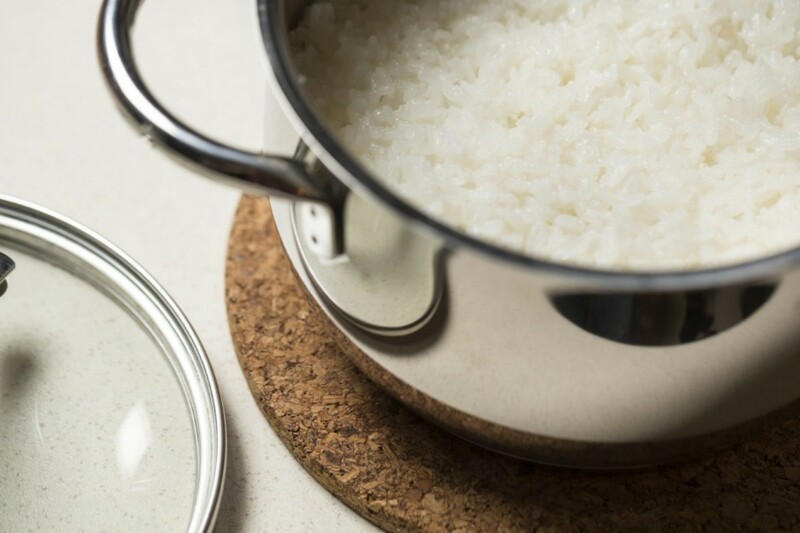 Most notably, fried rice and pilaf style rice have a greater proportion of resistant starch than the most commonly eaten type, steamed rice, as strange as that might seem. Understanding this, James and Thavarajva tested eight different recipes on 38 different kinds of rice found in Sri Lanka. What they found is that by adding a lipid (coconut oil in this case, because it’s widely used in Sri Lanka) ahead of cooking the rice, and then cooling the rice immediately after it was done, they were able to drastically change its composition—and for the better. So far they have only measured the chemical outcome of the most effective cooking method for the least healthful of the 38 varieties. But that variety still produced a 10 to 12 percent reduction in calories. “With the better kind, we expect to reduce the calories by as much as 50 to 60 percent,” said James. The prospect of lower calorie rice is a big deal. Obesity rates are rising around the world, particularly in the developing world, where people rely more heavily on cheaper food staples. China and India, which are already seeing rising obesity problems, are huge consumers of rice. Rice, of course, is not the sole cause of weight gain. But reducing the amount of calories in a cup of rice by even as little as 10 percent could have an enormous impact for future generations. The researchers still have to test the remaining varieties of rice, including Suduru Samba, which they believe will produce the largest calorie reduction. They also plan to experiment with oils other than coconut oil, like sunflower oil. A world where commercially sold rice comes pre-cooked and with much fewer calories might not be that far off. People should already be able to replicate the process at home, although James warns the results might vary depending on the type of rice used. And there’s good reason to believe the chemistry could be applied to many other popular but less-than-healthy foods. This entry was posted in Rice and tagged 38 different kinds of rice, diabetes, Dr. Pushparajah Thavarajah, food chemistry, Rice, Sudhair James. Bookmark the permalink.